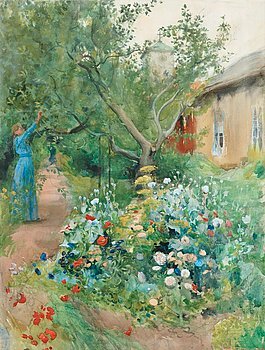 “Garden scene from Marstrand” has not been exhibited since 1953 and has never previously been offered for sale. Here we see a prominent period in Carl Larsson’s life in which he created his major masterpieces, the Fürstenberg Triptych and the National Museum Frescoes. The watercolour is to be sold at the most exceptional auction of the spring, the Important Spring Sale to be held on 7–8 June. Viewings 1–6 June. In an idyllic garden with Marstrand church in the background, we find an inspired Carl Larsson exploiting the characteristics of watercolour to the full. The sharp contours are not yet seen; instead the colours flow melodiously into each other and the green of the watercolours is cautiously broken by the model in the blue dress in the background. We might recognise the red accents from his French poppy field, but they feel just as refined in Marstrand as they do in Grez-sur-Loing. This item in the catalogue was painted in Marstrand 1889, a successful year for Carl Larsson. The friendship between artist Carl Larsson and Pontus Fürstenberg came to influence the artist’s life in many ways. The two were united by art purchases, correspondence and opinions on art in society, leading to Larsson taking up the post of teacher and headmaster of the Valand School of Art in 1886. In 1888 the Larsson family travelled to Paris where work on the Fürstenberg Triptych (“Renaissance, Rococo, Contemporary art”) began. The work was rewarded with gold – in the following year the triptych won the first class medal at the World’s Fair in Paris. With this victory secured, the Larsson family returned to Sweden, to a new home given them by Karin Bergöö-Larsson’s father, Lilla Hyttnäs in Sundborn. The rest, as they say, is history. 518. Carl Larsson, Garden Scene from Marstrand on the West Coast of Sweden.